This month saw a fresh crop of new stories about how drones are changing our world. There are hopeful possibilities and disturbing warnings, each one demonstrating what a disruptive technology really looks like. And meanwhile, over a million drone enthusiasts are blissfully enjoying this new magical machine that can fly. It all builds to one unmistakable message: We’re still learning how to live in a world full of drones. Last week, we learned that drones could be used in India to transport organs, according to the International Business Times. Livers, hearts and other vital organs would be ferried overhead and across town, all while staying preserved inside of a special box — or possibly even within the body of the drone itself. A team of engineers from the National Design and Research Forum in Bengaluru plans to focus on delivering hearts first since the other organs can be preserved much longer. Right now its team is finalizing specifications from doctors and engineers, to be followed (hopefully) by government funding. Drone deliveries would cut transportation times by more than 50 percent, researchers say, saving crucial minutes, and ultimately also saving more lives. The biggest difficulty may just be achieving the proper range — over 60 miles. Meanwhile, the Canadian Broadcasting Corporation reported last week that two drones had been spotted near the giant wildfires in British Columbia. It reminded readers of an incident last August in which drones reportedly hampered firefighting efforts, with eight helicopters and five firefighting planes remaining on the ground for more than three hours due to fears of a mid-air collision over the flames with a recreational drone. While Canada’s drone pilots don’t need a license, the CBC points out that there are federal regulations banning drone use near wildfires, with penalties up to $25,000 and 18 months in jail. “I want to ask anybody who has a drone keep it grounded,” British Columbia’s premier had announced last August, “because we can’t fight fires when you’re up there.” And that article reminded readers of an earlier incident in August of 2015 where yet another firefighting helicopter also remained grounded because of a drone. “We want to stress the fact that this is illegal,” Fire Information Officer Melissa Klassen had told the CBC. But the same day, Reuters was reporting that drones would be used after the fire to pinpoint where the blaze began — using drones “about the same size as those hobbyists use.” Equipped with special infrared and ultraviolet cameras, the drone’s photos will be used to reconstruct details of the fire’s path to within 30 feet of its source, according to Reuters, a situation where the downdraft from a helicopter’s blades would disturb the evidence on the ground. But some people see business opportunities in other people’s problems. 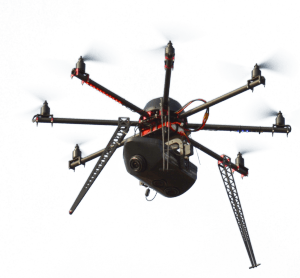 A company called DeTect has plans to monitor the skies for drone-controlling radio signals — by distributing a free crowd-sourced app called DroneWatcher. Its users will gather data passively through the wifi receivers in their smartphones, which will then be automatically forwarded to security officials — for example, at stadium events or at airports. And this report comes with its own reminders about past instances of badly-behaving drones. In October, a drone crossing Turkey’s border with Syria prompted the mobilization of warplanes to shoot it down. And in 2014 a drone carrying a flag interrupted an international soccer match in Serbia, triggering a brawl between players and fans, after which the game was never completed. But drones could become even more problematic. Last week Kansas passed new legislation which expands their anti-stalking laws into the world of drones. The state’s definition of “harassment” was updated to include spying on people with a remote-controlled drone — apparently in response to one woman’s experience with her neighbor. Drones are expected to eventually become a multibillion-dollar industry. New regulations governing the technology is probably inevitable. And meanwhile, in Michigan, a prison reports that a $14 drone has flown over their walls — a Teenage Mutant Ninja Turtle Heli Ball. 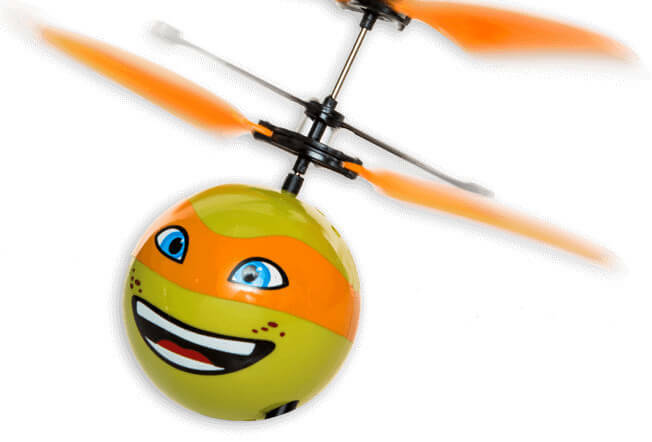 Feature Image: Teenage Mutant Ninja Turtle Heli Ball.